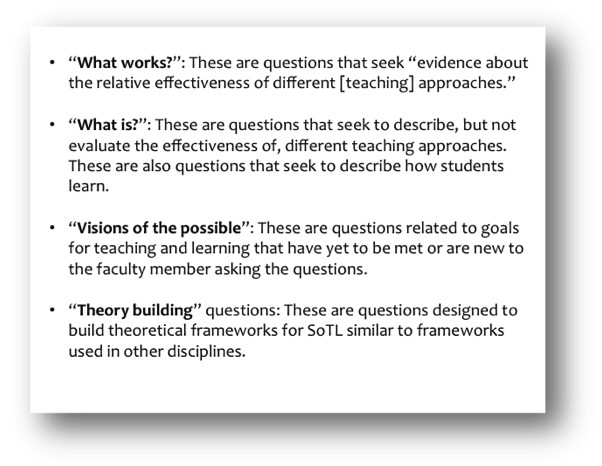 Applying this disciplinary framework of “problems” as the beginning of a meaningful project to our teaching not only reinforces SoTL as a scholarly and familiar process, but also paves the way for greater problem-solving in the classroom. By changing how we view teaching-related problems, we respond not with complaints and surrender to the status quo, but with curiosity, investigation, and inquiry—ways of thinking that start with questions. Hutchings’s introduction to Opening Lines: Approaches to the Scholarship of Teaching and Learning (2000) offers the most frequently cited taxonomy of SoTL work, categorized by the kinds of questions a project asks and answers (pp. 4-5). The box to the right summarizes each of the four kinds of projects she identifies. 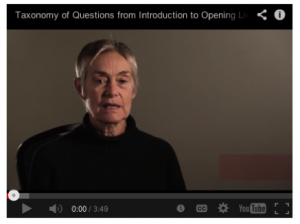 The video below offers Pat Hutchings’s reflections on her SoTL taxonomy.